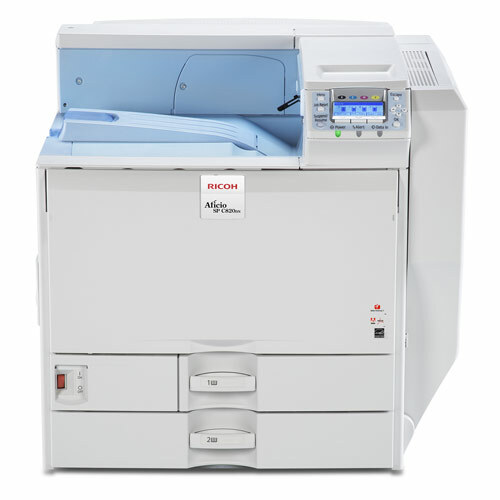 The Ricoh Aficio SP-C820DN can support busy workflows in office environments with its warm-up time of just over half a minute and its first page out time of less than eight seconds. The laser tech produces clear and consistent images in both black and white and colour. Users can load up to 1,100 sheets at a time with two 550-sheet trays located at the top of the printer. The Ricoh Aficio SP-C820DN is perfect for businesses that require excellent prints at scale, day in, day out. The large footprint and substantial weight of the Ricoh Aficio SP-C820DN is testament to its premium build. It measures 26.4 x 26.4 x 25.2 inches and features a light grey finish with blue accents to complement bright and contemporary workspaces. Users have access to wired LAN and USB interfaces and can enjoy a maximum media capacity of 3,200 sheets. The printer is also Energy Star Version 1.1 compliant, which helps to reduce the watt usage during operation. The maximum image quality reaches 3600 x 1200 dpi for excellent in-house professional prints. The Ricoh Aficio SP-C820DN is equally adept at producing reports, marketing materials and presentations of the very highest standard. GelSprinter solutions deliver the high media capacity and image quality that leading enterprises expect. It can print 40 pages in colour and monochrome in one minute, while automatic duplexing is available to cut long-term costs. The standard 512MB RAM can be upgraded to 1GB to improve performance further. The large footprint of the Ricoh Aficio SP-C820DN may be a drawback for smaller enterprises with compact office spaces, and the standard 512MB RAM and 600 MHz processor may be insufficient specs for those with ultra-graphic-intensive needs. There are no mobile connections or cloud-ready applications available either.